A Liverpool supporter pulled fans from a "human cascade" on the terrace at Hillsborough, he has told a court. Frederick Eccleston said the central pens of the Leppings Lane terrace were "ram-packed full of people" while pens to the side were "half-empty". He told Preston Crown Court he recalled "pulling people by their arms, their legs, their hair, their cheeks". 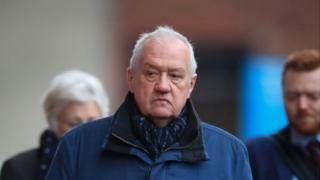 Former match commander David Duckenfield, 74, denies the gross negligence manslaughter of 95 fans. Mr Eccleston said said he attended the FA Cup semi-final on April 15 1989 with his son and a family friend and watched the match from a corner overlooking the Leppings Lane end. The former nursing manager said that when the match was stopped he went on to the pitch to help and joined a police officer pulling fans from the central pens. He said: "We both were pulling people out of that human cascade, it was like a waterfall with people tumbling on each other." He told the court he had attended the stadium for Liverpool's 1988 semi-final, but on that occasion the tunnel to the central pens had been blocked off. "There were a number of police officers and stewards standing together, they said 'no, this is full, these pens are full, you can't come down here', those were more or less their words," he told the court. The court also heard from former police constable Fiona Nicol, who was stationed on the perimeter track in front of the Leppings Lane terrace. Asked for her impression of former chief superintendent Mr Duckenfield, she said: "I did believe him to be 'what he said went', and if he told us what was going to happen and that's how he wanted it to go, that's the way we were supposed to do it." She told the court he had visited her and colleagues at Hammerton Road police station just weeks before the disaster and "basically told us he was here to sort it out and make us toe the line". The court heard that officers stationed in front of the terrace were told no-one was allowed access to the pitch perimeter track from the pens without consent of a senior officer, except to receive medical aid. But Ms Nicol said she opened the gate to pen three to allow fans to leave and enter a side pen after a man with a group of boy scouts asked if they could move. She said: "I was frightened about opening the gate because I knew I wasn't meant to but I also could see these children were clearly upset and I thought I could walk with them back down to pen one and it wouldn't cause too much of a problem." Earlier, former police inspector Robert McRobbie told the court he could recall no orders after Mr Duckenfield authorised a gate to be opened. Mr McRobbie, who was observing the operation in the ground's police control box, said Mr Duckenfield twice refused requests from an officer to open a gate to relieve a crush outside the ground before agreeing to a final "frantic" appeal. Part of the prosecution case against Mr Duckenfield, of Ferndown, Dorset, is that he gave no thought to what would happen when people flooded through the gate and were drawn down a tunnel to pens that were already packed with spectators. He is on trial alongside Sheffield Wednesday's ex-club secretary Graham Mackrell, 69, who denies a charge relating to the stadium's safety certificate and a health and safety charge. Under cross-examination by Mr Duckenfield's defence barrister, Ben Myers QC, Mr McRobbie agreed that in a statement he made in 2014 he said he was impressed with the standard of attention to detail from Mr Duckenfield when he briefed police at Hillsborough on the morning of the match.